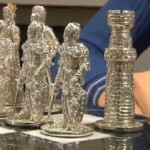 Siberian jeweler Ruslan Tymoshchuk from the city of Krasnoyarsk has created literally precious chess. 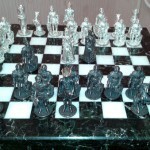 Figures are made of silver and gold, the board – made ​​of marble. His work has evoked the admiration of his colleagues from around the world. 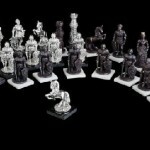 Today it is the most expensive chess in Russia, the collection is estimated at 5 million rubles, but the master is not ready to sell it. The master has made the first work of this magnitude, although he is an experienced craftsman. He has been engaged in jewelry art for decades, not once participated in jewelry exhibitions and international competitions. 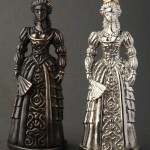 But even this chess set is special, in the Russian jewelry art was never created anything like this. 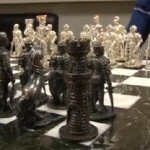 Chess collection made by ​​Ruslan Tymoshchuk – the most expensive in Russia. Its cost is estimated by experts at 5,000,000 rubles. 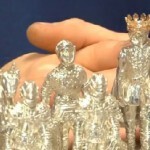 At the same time the most expensive in the world are still made ​​in 2005 “Royal Diamond Chess” from the workshop of Bernard McQueen (500 thousand dollars). Initially, Ruslan made ​​a single silver figurine of English warrior of XII century, then another miniature statuette of early Middle Ages. 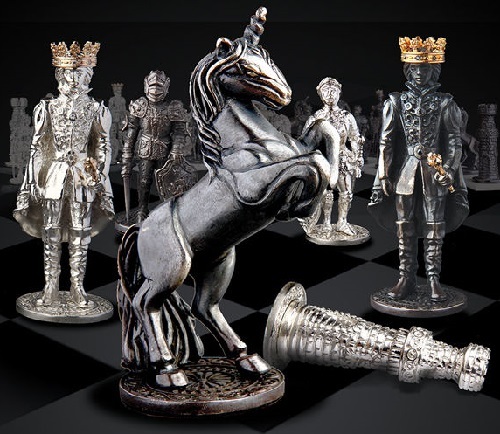 But then came the idea to combine a collection of miniatures into a chess set. If we talk about the style in which they are made, then after the very first soldier, I began to focus on England of the XII century. I sat in the library, searched for information about clothing, jewelry, weapons of the period, watched what ornaments of that time. In the end, all the pieces fit this style. 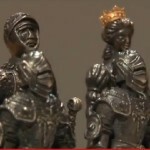 Except that the king and queen – they resemble the image of the XVI-XVII centuries. Work on the collection lasted exactly one year. This required a special technique through which precious pieces vary in color – one black, the other almost white. Manually it was practically impossible to do. But otherwise the jeweler didn’t work. He was working on different shapes and complexity: some were easy to make, others were more complicated. As it’s recognized by Ruslan Tymoshchuk, the figure of a horse took much time to make. It is not strictly vertical, inclined, it was necessary to do all the calculations correctly. 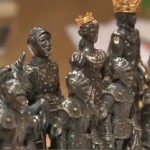 As a result, Ruslan got this precious collection – 32 pieces of silver 925, the King and Queen crowns and wands of 585-th test – this is indicated by public stigma. Checkerboard – marble. The total weight of the figures – 4.7 kg, the board – 23 kg, the entire collection, respectively – more than 27 kg. Clearly, into this work the master not only put a lot of strength, but also funds. 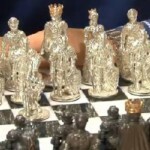 The beautiful jewelry chess set was estimated by experts at 5 million rubles. However, Ruslan Tymoshchuk is not going to sell it.